2 My Home Page Holding On Ken Gagne My father introduced me to the Apple II; after his passing, our original IIe serves as a reminder of him. 3 Letters Tom Galway A reader receives Error $27 when trying to read a disk with an AppleWorks GS database. Tony Diaz recommends some ways to repair the volume. 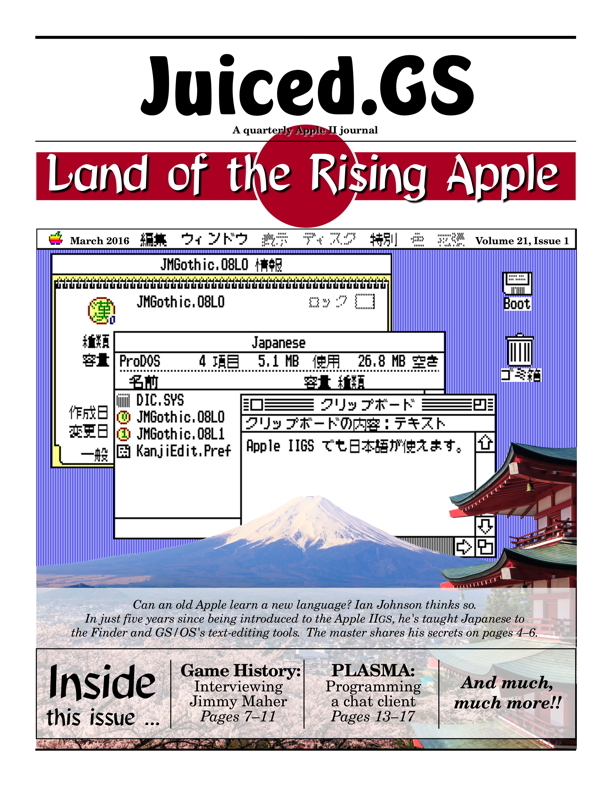 4-6 Behind the Scenes Mastering a New Locale Ian Johnson How the author added support for Japanese to GS/OS and the Finder, and improved text selection tools for Roman characters. 7-11 MusinGS Entertaining History Ken Gagne Jimmy Maher of The Digital Antiquarian discusses his ongoing chronicle of computer game histor;, his visit to the Strong Museum and ICHEG of Rochester, New York; and his Patreon crowdfunding campaign. 12 Advertisement AuctionSieve eBay monitoring and bidding tool for Mac, Windows, and Linux. 13-17,23 Programming David Schmenk Using PLASMA to develop an Apple II chat chient. 18-19 Reel ][ Reel The Fact and Fiction of Steve Jobs Eric Shepherd A review of the movie "Steve Jobs", written by Aaron Sorkin, directed by Danny Boyle, and starring Michael Fassbender. 19-20 TidinGS Revisiting Old Lessons Kate Szkotnicki A high-school teacher uses real and virtual Apple II computers give her students a lesson in Oregon Trail, Number Munchers, Odell Lake, and The Factory. 21-22 DumplinGS Starting the Year Strong Ken Gagne Mike Harvey to keynote KansasFest 2016; Vintage Computer Festival (VCF) 2016 dates; Charles Mangin of RetroConnector releases the Uthernet II Light Pipe; UltimateMicro now shipping a Mockingboard clone and A2DiskController; Lucasarts' Macross 6502 assembler now open source; Steve Wozniak hosts a reddit AMA and stars in Formative video; Kelvin Sherlock releases Apple IIGS Image Viewer for Mac OS X; GDC 2013 hosts talk from Bill Budge and appears on Open Apple; Brutal Deluxe releases You, Dusthead! and update to i'm fEDD up; Robert Palladino, Wesley A. Clark, and Ray Tomlinson pass away. 23 Random Numbers Decisions, Decisions Eric Shepherd Having moved into a new house, Sheppy must now decide which computers in his classic Apple collection to set up, and which to leave in storage. Running the family business on an Apple II in 1998. Jason Scott reminds you to archive your floppy disks before they degrade to the point of being unreadable. How Jason Scott and Tony Diaz rescued Jordan Mechner's 5.25" floppy disks. Jimmy Maher's history of computer entertainment. Part of the Strong Museum of Play of Rochester, New York. Mike Maginnis and Ken Gagne's podcast interview with Jimmy Maher. Proto Language AsSeMbler for Apple, an Apple II programming language by David Schmenk. David Schmenk's evening session from July 16, 2015. Eric Shepherd's review of the movie written by Aaron Sorkin, directed by Danny Boyle, and starring Michael Fassbender. An annual Apple II convention held July 19–24, 2016, with a keynote by Mike Harvey of Nibble magazine. VCF events being held across the country throughout the year. A peripheral from Charles Mangin for the Uthernet II networking card. Developers of the Mockingboard clone card and A2DiskController. A compiler used by Lucasarts and released by The Museum of Art and Digital Entertainment (The MADE). Steve Wozniak's Ask Me Anything, as well as his Formative video. A Mac OS X utility from Kelvin Sherlock. Bill Budge's presentation from the 2013 Game Developers Conference (GDC). A disk-copying utility from Brutal Deluxe, compatible with the EDD card. A disk drive-cleaning utility from Brutal Deluxe (requires separate disk cleaner). The Trappist monk and Reed College instructor who taught calligraphy to Steve Jobs, passed away in February 2016 at 83. Inventor of DEC's Laboratory Instrument Computer (LINC), passed away February 22 at 88. Inventor of email, died March 5 at 74.